Most people don’t realize that Amish have called the state of Tennessee home for 70 years. 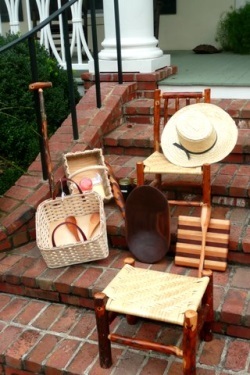 But many Tennesseans are familiar with Amish woodworking. Due to the growing popularity of Amish-crafted home furniture, Nashville has seen an increase in outlets selling the wares of Amish wood craftsmen. The greater Music City area is home to numerous Amish furniture stores easily accessible to residents of Nashville and surrounding suburbs and towns, including Brentwood, Franklin, Murfreesboro, Spring Hill, Hendersonville, Lebanon, Madison, La Vergne, Smyrna, Bellevue, Fairview, Clarksville, Springfield, White House, and others. Use the guide below to locate Nashville-area Amish furniture stores, as well as locations of Amish settlements near Nashville. The Tennessee Amish Furniture directory also lists stores outside the area. Hardwood furniture crafted by Amish and Mennonite artisans from Lancaster County, PA. Home furniture pieces for dining rooms, bedrooms, family rooms and entertainment centers. Furniture customizable, options including wood, skirting, edging, stain, and finish. Full bedroom suites, family room furniture including end tables, sofa tables, corner tables, recliners, gliders, chairs, sofas, loveseats and more. Dining rooms by Keystone Collections. Also sells entertainment centers and natural latex mattresses. Located just south of Nashville in Franklin. Amish furniture dealer offering handcrafted wood pieces for dining rooms, bedrooms, living rooms, outdoor and more. Products include dressers, beds, nightstands, mattresses, dining tables, chairs, entertainment centers, occasional furniture, hutches, cabinets, TV stands, benches and more, in Shaker, Mission, Queen Anne, and numerous other styles. Furniture sourced from Keystone Collections (built by Amish craftsmen from Pennsylvania). Carries mattresses by Dutch Craft Mattress Company (Amish-made). Within a short drive southeast of Nashville. Also specializes in furniture restoration and refinishing. Lying one hour west of Nashville, Countryside Woodcraft specializes in outdoor furniture and gazebos made by Amish craftsmen from Ohio and Pennsylvania. Their offerings are available made-to-order and in the form of self-assembly kits. Products include vinyl, poly and wood (cedar and pine) outdoor furniture, along with porch swings, picnic tables, Adirondack chairs, rockers, kids’ playhouses, cabanas, and children’s swingsets. Lancaster Amish-built gazebos in both standard sizes and custom-order (available in western red cedar, treated pine or vinyl). Countryside also carries pergolas produced by local Mennonite craftsmen. Located within half an hour of Clarksville. Retail store found in the Ethridge Amish community (see below), approximately 1.5 hours south of Nashville. 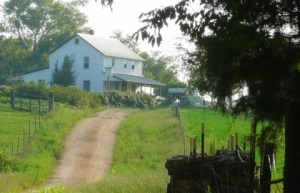 The state of Tennessee is home to 7 Amish settlements as of 2013. Amish have found the Volunteer State increasingly attractive in recent years, with three communities founded in Tennessee since 2009. While there are no Amish on the figurative doorstep of the Music City, a number of Amish communities can be found within a 1-2 hour drive of the capital. While some Amish furniture shoppers may prefer to shop in a Nashville-area retail outlet, others may wish to arrange custom furniture with an Amish woodworker. While Amish have traditionally operated dairy and other types of farms, entrepreneurialism is alive and flourishing among Amish. Home-based shops are very common, including woodworking shops. Amish home businesses are usually easily identified by the simple, often hand-lettered signs standing on the roadside or at the end of farm lanes. Finding Amish furniture from the source requires more work, and not all Amish sell their goods on a retail basis. However, for those with the time and interest, a trip to an Amish settlement can be both an enlightening experience and a good way to find a craftsman to create the ideal piece of furniture for your home. Ethridge (Lawrence County): The Ethridge Amish community, established in 1944, is by far the oldest and largest in the state. Approximately 1,500 Amish live in the area of this southern Tennessee town lying about an hour-and-a-half south of Nashville. The Amish at Ethridge are among the most traditional, using only limited technology compared to other Amish, and being more resistant to change than most. At the same time, the Ethridge community, as evidenced by its proliferation of Amish-run small businesses, is rather friendly to tourists. 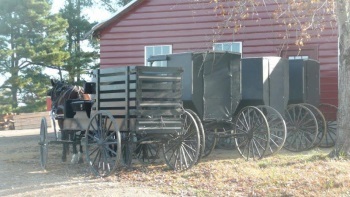 A number of non-Amish businesses including wagon rides and an “Amish Welcome Center” help visitors orient themselves in the area. The community of Ethridge is home to five dozen Amish home businesses, including basket makers, tack shops, produce and canned goods vendors, candle shops, and a number of woodworking shops producing both interior and outdoor furniture. There are also a few non-Amish eating establishments in the community. A helpful map provided by the Amish Welcome Center pinpoints the locations of the many Amish home enterprises at Ethridge. A note of caution: be wary of Amish buggies in this area, which due to the conservatism of their owners are not equipped with the common orange Slow-moving-vehicle (SMV) safety triangles. Summertown: The Summertown Amish settlement is the closest to Nashville, at just over an hour’s drive away. This small community was founded in 2000. Other Tennessee Amish communities: A number of Amish settlements lie roughly 2 hours or more from the state capital, including at Huntingdon in Carroll County, Adamsville (McNairy County), and Deer Lodge (Morgan County) in eastern Tennessee. All are small settlements of anywhere from a handful to a few dozen households. I have a silverleaf maple tree that needs to be cut down if any furniture makers are interested in doing so in exchange for the wood. Call 615-228-6295 before 7:30 p.m.